The United States Securities and Exchange Commission’s Office of the Whistleblower (“OWB”) posted a Notice of Covered Action (“NoCA”) on the SEC’s website. Four individuals submitted claims for SEC whistleblower rewards in the case. The SEC’s Claims Review Staff (“CRS”) recommended granting an SEC whistleblower reward to one of the claimants, identified as “Claimant 1”. Claimant 1 contested the amount that the CRS awarded and filed an administrative appeal to the Commission seeking an SEC whistleblower award increase. In its Preliminary Determination, the CRS also recommended that the Commission deny SEC whistleblower rewards to two of the other applicants. A third applicant’s claim for an award “was not processed”, because he or she had been permanently barred from submitting applications for awards due to having made numerous false and fictitious statements to the SEC previously, in violation of the SEC whistleblower rules. According to the Commission’s Order, Claimant 1 submitted original information that caused the SEC to open an investigation. Apparently, Claimant 1 also provided additional information of which the SEC had been unaware, and which assisted the SEC’s staff in its investigation. The amount of the award that the CRS had recommended for Claimant 1 was redacted in the Order. After considering the record de novo, the Commission chose to depart from the CRS’s recommendation as to the amount of Claimant 1’s award. 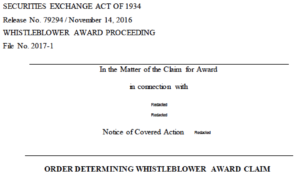 Based on the facts and circumstances of Claimant 1’s case, the Commission found that an upward adjustment to the award amount was merited, and granted an SEC whistleblower award increase. The Order referred to Claimant 1’s promptly coming forward with information about the wrongdoing. Claimant 1’s whistleblowing “enabled the Commission to move quickly to shut down” the fraud. This enabled the SEC “to obtain a near total recovery of investors’ funds … before the Defendants could squander those monies”. This whistleblower alerted us with a valuable tip that led to a near total recovery of investor funds. Sizeable awards like this one should encourage whistleblowers everywhere that there are real financial incentives to promptly reporting potential securities law violations to the SEC. The percentage amount of the increased award was redacted in the Order. However, the Order stated that the increased award “should equal a payout of at least $20 million”.